Sedation dentistry, a term that describes the methods used to manage patient pain and anxiety, allows dentists to help people relax during a dental procedure, while at the same time allowing patients to respond to physical stimulation and verbal command. Nervous about visiting the dentist? Sedation can help. You deserve a healthy, fabulous smile. Putting off routine checkups and minor repairs can result in the need for much more invasive dental treatment or therapy. If you have avoided undergoing necessary dental care because you dislike dental visits, sedation dentistry can allow you to comfortably receive the treatment you need. Inhalation sedation, such as nitrous oxide (also known as laughing gas), is typically administered in combination with a local anesthetic for pain prevention. Nitrous oxide, also known as laughing gas, calms and comforts patients even though they remain awake, in control, and with the ability to communicate. It also tends to lessen anxiety, increase a patient pain threshold, reduce an overactive gag reflex and make time pass more quickly. It is often used in pediatric dentistry. Oral Sedation involves pills or liquid taken orally. The medication allows patients to enter a state of total relaxation during treatment. Usually, patients also receive an injection of local anesthetic as well. These sedatives are administered directly into the blood-stream through the vein for the deepest level of sedation without general anesthesia. If you choose oral or IV sedation, a responsible companion must accompany you to and from the visit. Before any dental procedures commence, the sedative effects of the medicine will cause the patient to become drowsy and relaxed. Our dental team will attach you to a monitor so that the dentist can keep track of vital signs. At the completion of the dental procedure, you will be allowed to recover from the effects of the sedation before leaving the office with a friend or relative. Feel free to resume normal activities sometime in the next 12 to 24 hours, but someone should stay with you for the first few hours at home. If you are affected by any of the above issues, we can help. 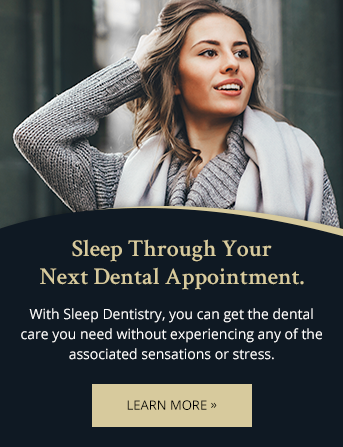 Though sedation dentistry has also been referred to as sleep dentistry, this terminology is inaccurate. There is a difference! With sedation, patients will feel very drowsy during the procedure and will not remember most of their time in the dental chair. However, the patient is actually awake throughout the treatment process, unlike with anaesthesia.